Blessed Daniel Brottier was a French Spiritan born in France in 1876 and ordained priest 1899. His zeal for spreading the Gospel beyond the classroom or the confines of France made him to join the Spiritan Congregation. He was sent to Senegal, West Africa. After eight years there, his health suffered and he went back to France where he helped raise funds for the construction of a new cathedral in Senegal. At the outbreak of World War I Daniel became a volunteer chaplain. He attributed his survival on the front lines to the intercession of Saint Therese of Lisieux, and built a chapel for her at Auteuil when she was canonized. After the war he established a project for orphans and abandoned children "the Orphan Apprentices of Auteuil" in the suburb of Paris. He gave up his soul to God on the 28th of February, 1936 and was beatified only 48 years later in 1984 by Pope John Paul II. Wasn't Archbishop Lefebvre a Spiritan? 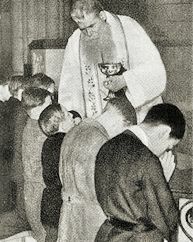 Archbishop Lefebvre was A Holy Ghost Father. Isn't that another word for the same group? Page created in 0.114 seconds with 30 queries.